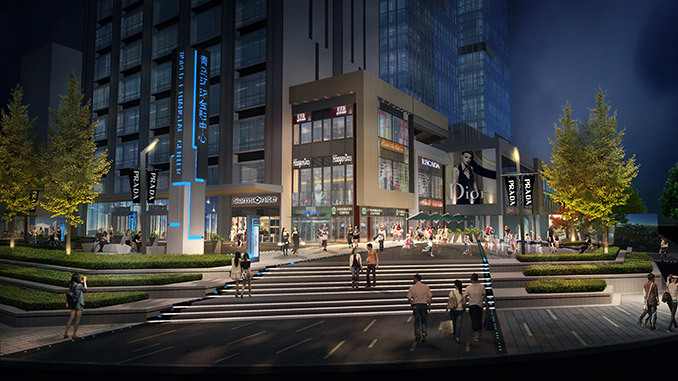 NSINCERE Qingdao World Financial Center will feature local corporate headquarters, high-end office space, a 5-star hotel, premium shopping mall and apartments in the Qingdao Central Activity District located on the northeast coast of China. ASPECT Studios designed and oversaw the landscape design for the project and also landscape construction of the Phase 1 show flat which provides a glimpse of what’s to come in the development and shows just what can be achieved through a collaborative approach to design. 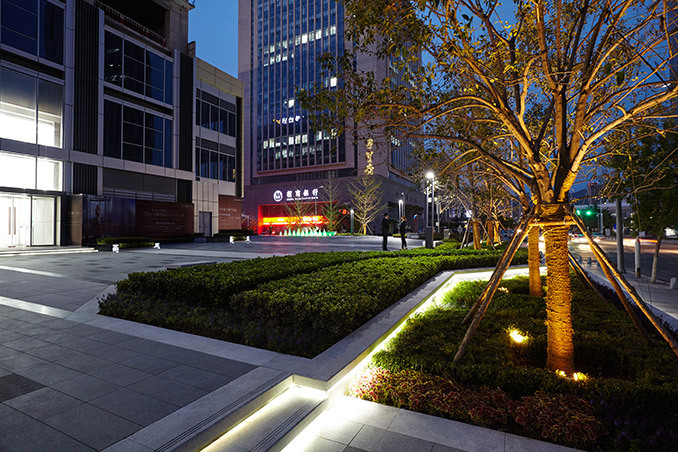 ASPECT Studios was engaged by NSINCERE Holding Group to design the landscape of this landmark project. 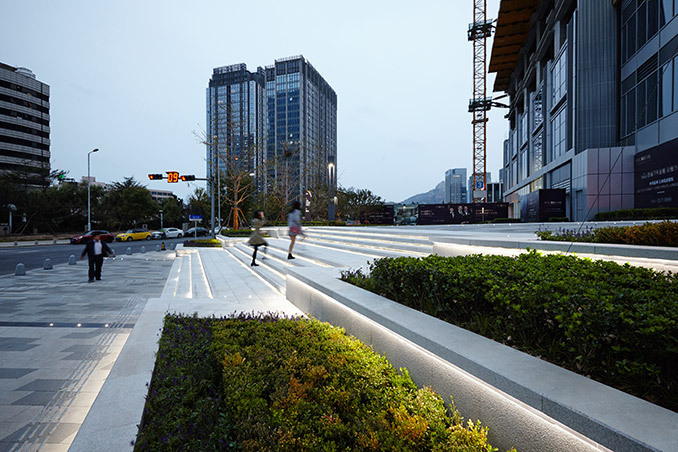 In response to the site’s significance within Qingdao city, and to create a modern, futuristic and high-end financial centre, light became the design inspiration for the project. Light is the symbol of hope and the beacon of appeal. It’s also essential to ourselves, with different forms and types of lights affecting our daily life. They used various forms of light to create specific functions and character within the site. 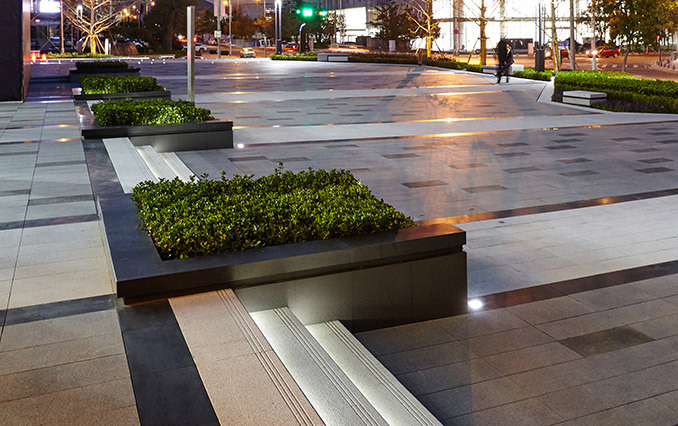 The planting design creates a clean and contemporary green environment within the financial zone. 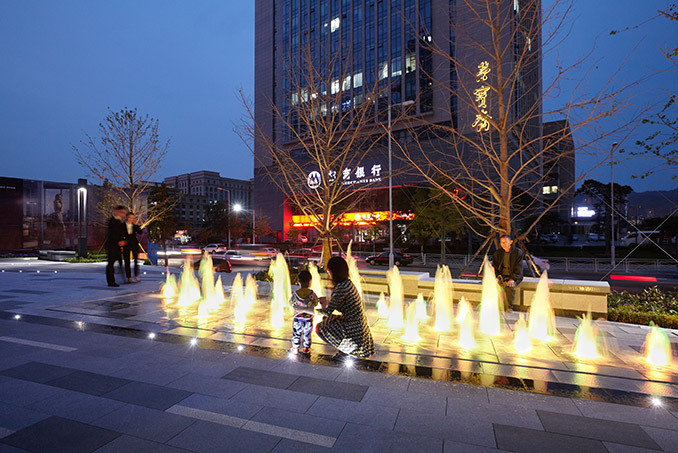 A pop jet fountain with changing colors not only brings activity to the space but also attract passers-by including children and adults to come and play and use the plaza. The design is not only for creating a retail environment but also to provide a vibrant and comfortable space for people to gather, relax, interact and enjoy, with various multi-functional spaces. The arrival plaza has an iconic character that draws people into the space. 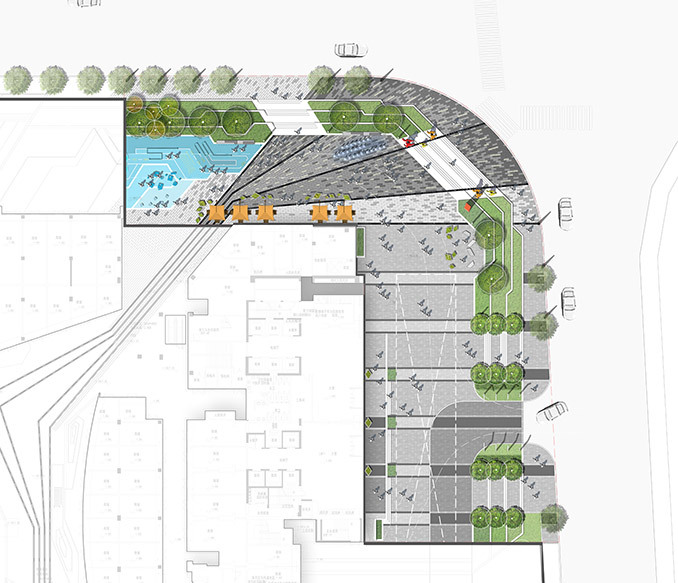 Contemporary retail streets with planting will be a vibrant and comfortable space for people to interact. 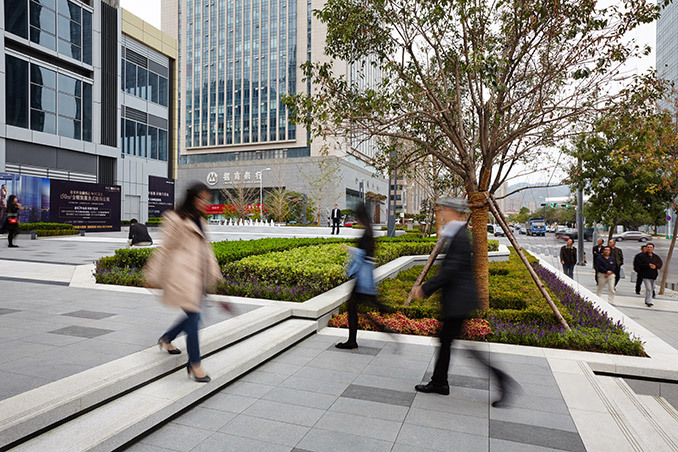 While the office arrival space has a welcoming and formal atmosphere, the inner courtyard garden will provide a green and cozy space for people to relax. There are also various zones that form an active, multi-functional space for office workers, visitors and guests to gather. No detail was left to chance throughout the entire design and construction process. ASPECT Studios assisted the construction team with technical aspects of the design and by working with the Landscape Director of NSINCERE Holding Group, ASPECT Studios’ Studio Director, Stephen Buckle, and Team Leader, Sean Xiao, visited the site to assist with the review of the construction and detailing. 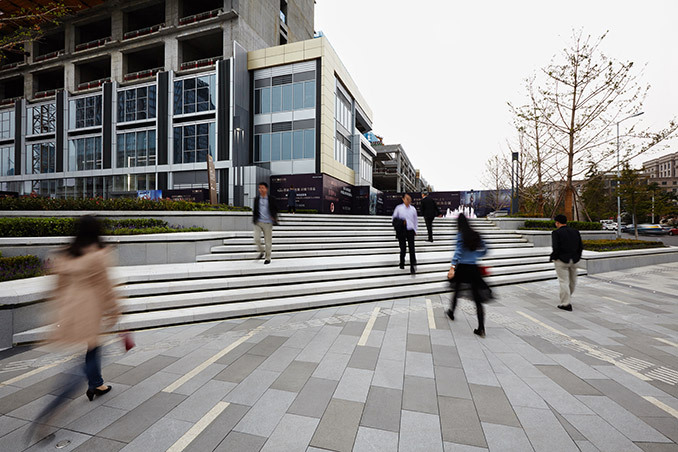 This included ensuring that the complex paving patterns and joints were constructed as they were envisioned during the concept phase with the final finishes resulting in a high-quality build. 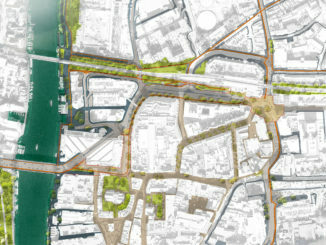 Much of the success of the project has come down to the close collaborative relationship with the client. ASPECT Studios worked closely throughout the entire process and discussed every detail – from level variations to the selection of material colors. 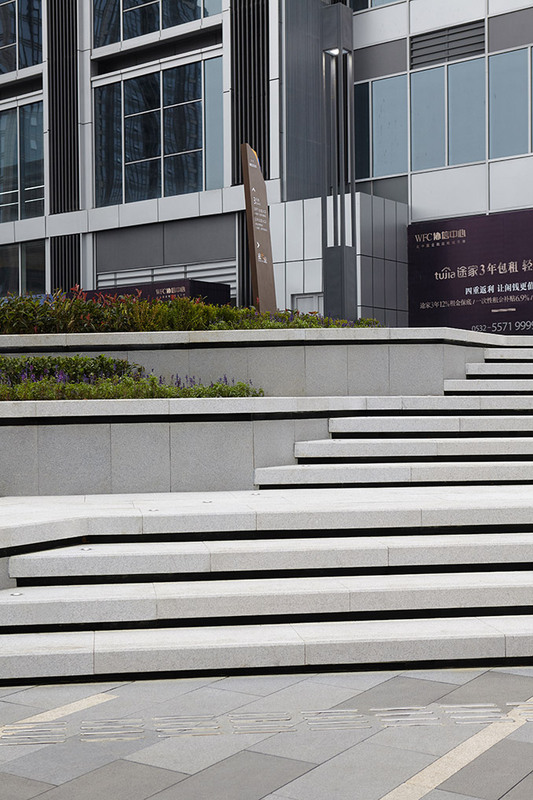 To ensure a natural gradation of paving colours from light grey to black, they discussed various options with the client and eventually selected eight different stone colours. 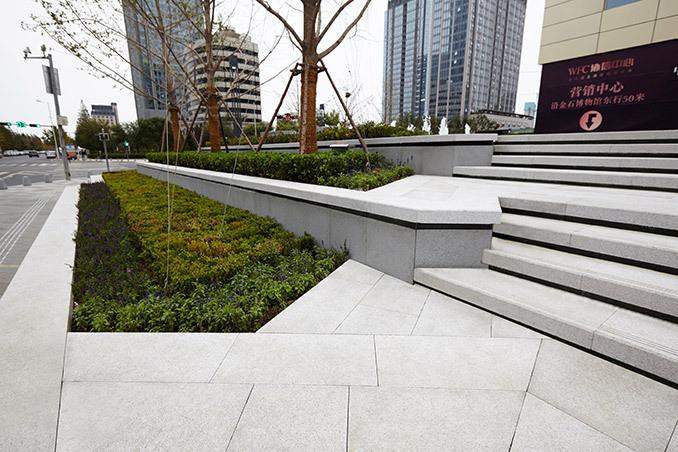 Levels differences between the building and landscape provided the opportunity to create a stepping landscape with planting beds with integrated seating edges to create intimate and social spaces for people. As a result, they not only overcame the level issue but also expanded the area for activity as much as possible. 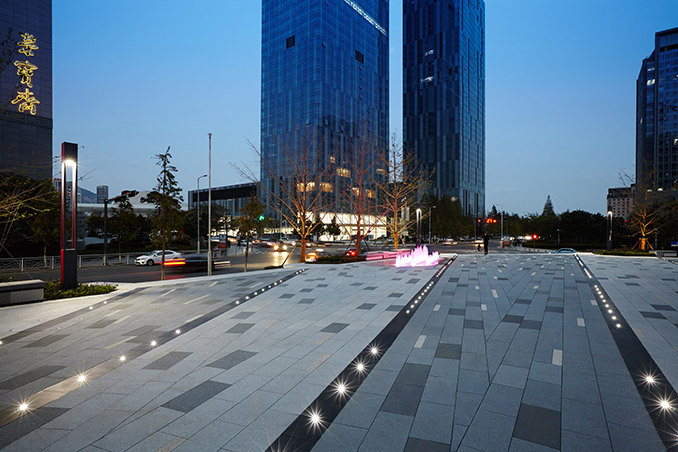 The show flat is only a small part of NSINCERE Qingdao World Financial Center but it clearly demonstrates the high quality of the development and the client’s commitment to quality landscape. 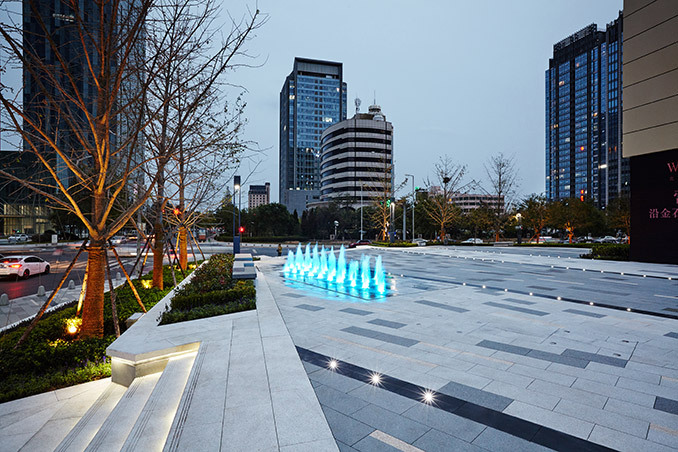 Architect | Shanghai Tianhua Architecture Design Co., Ltd.
Landscape Construction | Shandong Longkou Nanshan Landscape Engineering Co., Ltd.